(Photo courtesy of Ray Mickshaw/The CW) Spencer Paysinger (center) and Daniel Ezra (right) as his TV counterpart, Spencer James. The premise of the new TV series “All American” sounds like pure Hollywood — a talented high-school football player from South Central Los Angeles goes to play ball in Beverly Hills, encountering culture shock and resentment. Yes, it’s sort of a cross between “Beverly Hills, 90210” and “Friday Night Lights.” But no, it’s not a Hollywood invention. It’s based on a true story — the real-life experiences of former NFL player Spencer Paysinger, who’s an executive consultant on the show. “It’s crazy to see what an idea that I had a few years ago turned into,” he said. What it turned into is the best new show on TV this fall. It's not so much about high-school football as it is about race and class and economic opportunity — mixed with plenty of solid drama and, yeah, some good soap opera. Paysinger grew up in South Central L.A.; he was a star football player, and there was a shooting incident similar to what happens in the “All American” premiere (Wednesday, 8 p.m., CW/Ch. 30). And the fictional Spencer (Daniel Ezra) goes through what the real Spencer did at Beverly Hills High. He found himself going to school with rich kids who were dealing with drug problems and absent parents — as does his fictional counterpart. “Just dealing with that contrast was probably the biggest thing that I had to go through,” he said. “All American” is not a documentary. 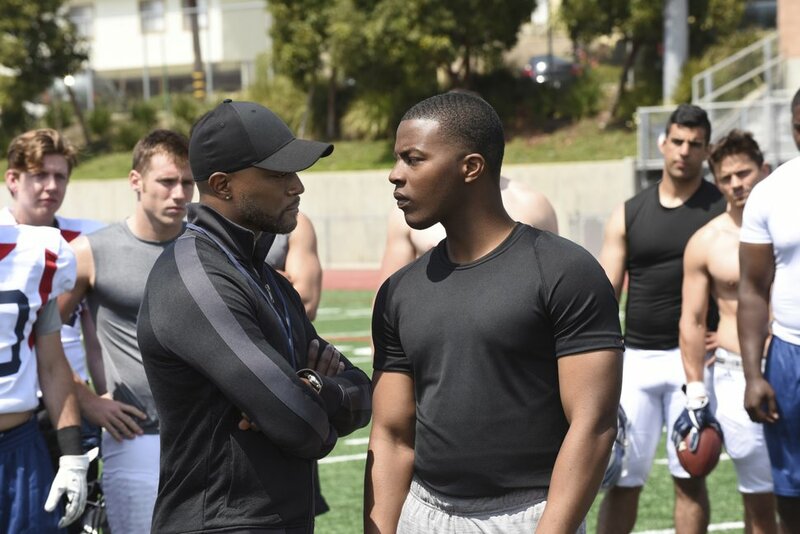 The fictional Spencer is recruited by Beverly Hills High football coach Billy Baker (Taye Diggs) — which is against the rules. To get around that, Spencer moves in with the Baker family. In real life, Paysinger was admitted to Beverly Hills High under a multicultural program that drew students from around the Los Angeles area. This is TV, so, yeah, the drama is heightened. The new series has plenty in common with a couple of other teen dramas, with one major difference. In “90210,” the Walsh twins moved from Minnesota to Beverly Hills and never looked back; in “The O.C.,” Ryan Atwood moved from Chino to Newport Beach and rarely returned. “All American” splits its time between Beverly Hills and South Central. “It really is a sort of tale of two cities,” said Blair said. “This is about a boy who really is straddling two worlds. … We go back every week. We give a lot of time and energy to telling stories in the community he comes from as well as the one he’s entered. The series is shooting regularly in places Paysinger grew up, from the school to the barbershop to the place where he experienced the shooting portrayed in the pilot. And “All American” shows South Central as more than just gangs and crime — “not just sort of the challenges of that neighborhood, but the beauty of that neighborhood as well,” Blair said.